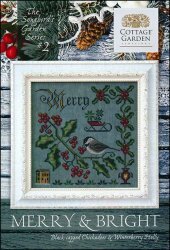 Songbird Garden Series 2: Merry & Bright [W5423] - $9.00 : Yarn Tree, Your wholesale source for cross stitch supplies. Cross stitch pattern from Cottage Garden Samplings. A beautiful black-capped chickadee sits on a branch of winterberry holly. Imagine taking a sleigh ride in the beautiful red sleigh that is stitched above the black-capped chickadee. May your Christmas be "Merry & Bright." Stitch count 159w x 159h.